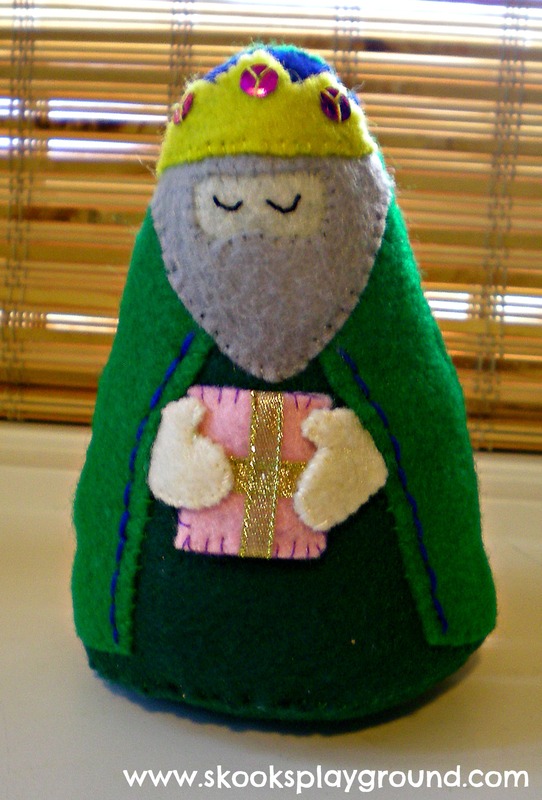 Maybe by the time Little Miss goes to college I will finish this felt nativity that I started in, oh, 2009. Apparently working on this project is an annual endeavor. I had high hopes of finishing it c.o.m.p.l.e.t.e.l.y. this year, but it's not looking too good. Too many projects, not enough time I'm afraid. Maybe a couple other gift-bearing friends will show up next year. They get played with heavily, but they're holding up ok so far. 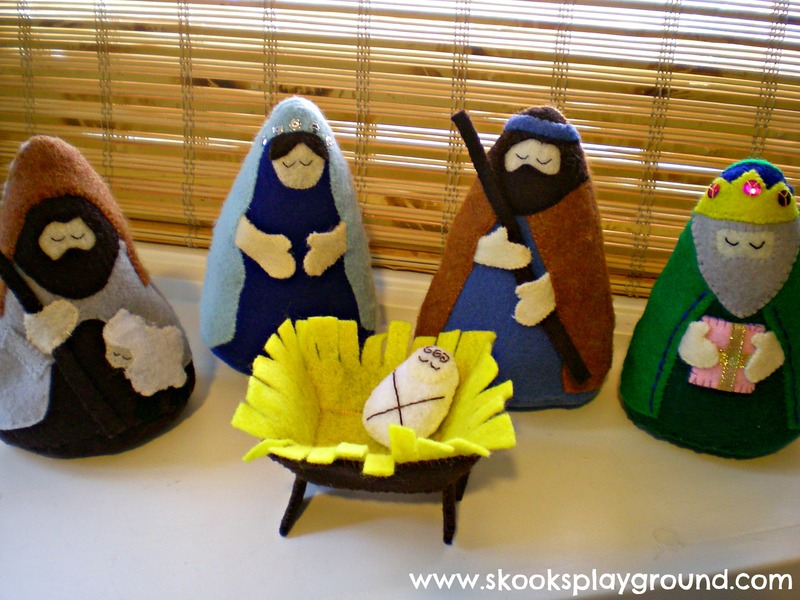 We've actually got 4 kid-friendly nativities sitting out on our bay window ledge that get played with regularly. I love having them available even if it means that I have to pick up stray shepherds and Josephs off the floor every day. In all honesty, it's funny to walk by there sometimes and see how the kids have set them up with all the marys chatting in a corner while the wise men hold a who-brought-the-bigger-gift council. For those even later to this party than the latest addition, the pattern is by Bugga Bugs on Etsy. Anyone else still entrenched in Christmas decor making? I'm starting to lose steam, but I WILL finish the kids' new stockings before D-Day if it kills me! I've had this idea in my head for a long time. Sadly, making stuff has been going at a snail's pace for me lately so what should have been a relatively short and easy project ended up getting dragged out over the better part of a month. 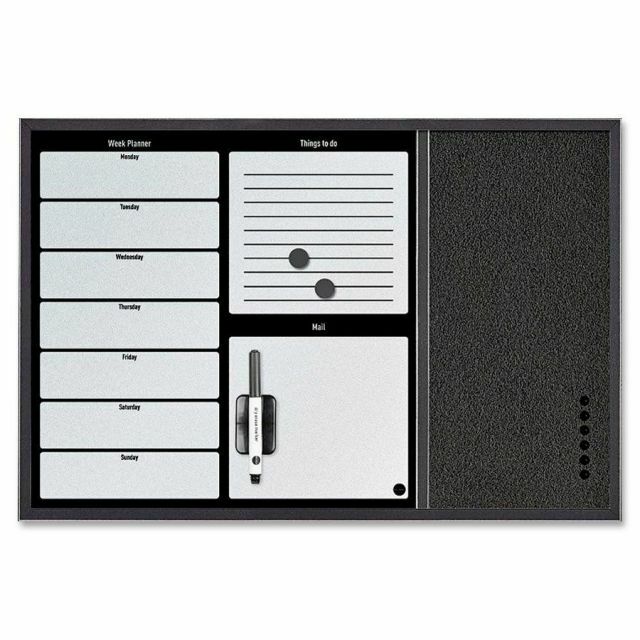 I started out with a sort of command central-ish wipey board that I got from (Target? Meijer? Walmart? 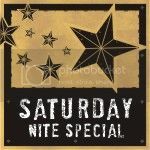 - - I canNOT remember right now, but they sell similar stuff at a lot of places and I got it ages ago) and a chunky barnwood-like frame that I had sitting in my attic. It used to house a print that I liked, but didn't *love* and somewhere in our last move the glass off the front broke. Rather than reframing the original print, I decided to use it for something else. Sidebar about this project: I had been using this wipe board in its original state since I got it several years ago. 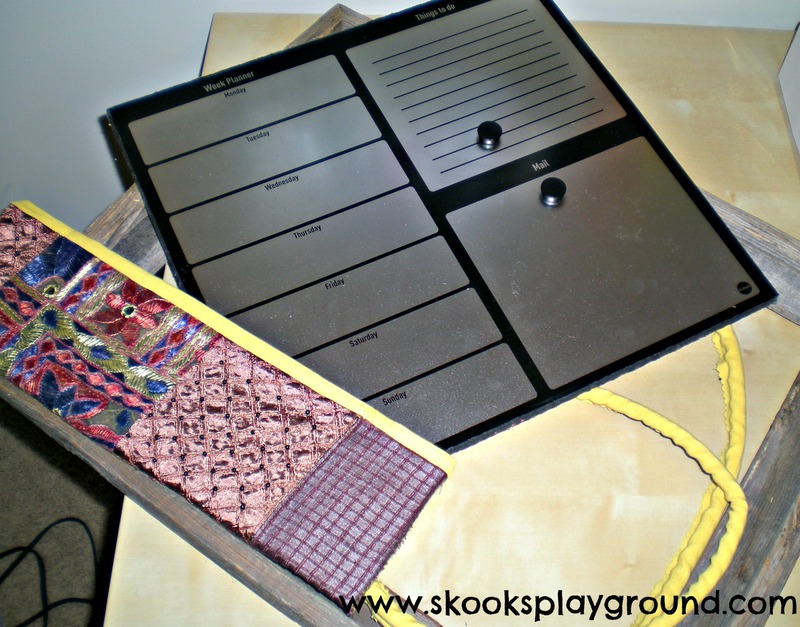 It worked perfectly in the kitchen in our last house and we used it to jot down daily reminders for events as well as chores and meals we were making that week. In our "new" (we've been here 2 years!) house, we put it in the kitchen as well . . . and somehow it has been majorly underutilized and not even terribly noticeable off in a corner of the room. In other words, it just wasn't doing its job anymore. Recalling the functionality of it and wanting to get that back, I had to come up with a new plan. Hence this whole project. Another sidebar: While I didn't have a problem with using the board as-is previously, the place I wanted to move it to near the front door did not have a space wide enough to accommodate it without the whole wall looking awkward. Because it was going to be visible to every person who came over to my house I also wanted it to fit more into the decor. Flipped the whole board over and jimmied the little pin board part (that black abyss on the right) off the frame. Found a screwdriver or pliers or hammer (can't remember now . . . a plunger?) and pried the little wood divider that separated the wipe board section from the pin board section. I slipped the wipe board section out. Dug through my paints (not that there are a ton, but I had to find them!) and found some black acrylic which I used to touch up the now raw-edges of the wipe board. I was going to cover them up, but I didn't want any yucky edges peeking through and this was a quick step to ensure that didn't happen. Played around with a few different ideas of how I wanted the final board to look and what I wanted it to accomplish. One part of the original board that we never really needed much was the pin board, so I opted to eliminate that idea completely (my new frame wouldn't fit it anyway) and dreamed up a fabric-covered pocket. As the hardware on my frame was already set to hang vertically, I decided to just work with it and opted to put the wipe board up top and the pocket underneath. After I settled on where I wanted the pieces to lay, I took a piece of foam core board and cut it down to act as the stabilizing base of the pocket. I scavenged my scraps and found a piece that I had used EONS ago to make a messenger bag (as in, I had my friend make me a messenger bag from it because at the time I did not know how to sew). It fit in well with my decor as well as my rustic frame so I went with it. I had some mustard-y home decor fabric sitting in my stash that I pulled to use for the inside of the pocket (as the decorative piece wasn't terribly stable on it's own). I used a piece of piping thick enough to fill in the gap between my board pieces and the frame and covered it with my mustard fabric for a little contrasting color pop. Had I cut my pieces big enough I would have done this next part differently, but as it was I had to work with my mistakes so I just grabbed some packing tape and secured the bits that did overlap to the back of the foam core board that I'd cut for the pocket. It wasn't pretty, but it was also not going to be seen so I didn't really care. Hot glued the piping snug to the inside edge of the frame. Mr. Skooks rummaged up some wood glue and glued the wipe and pocket board pieces down. We gave it the proper cure time. 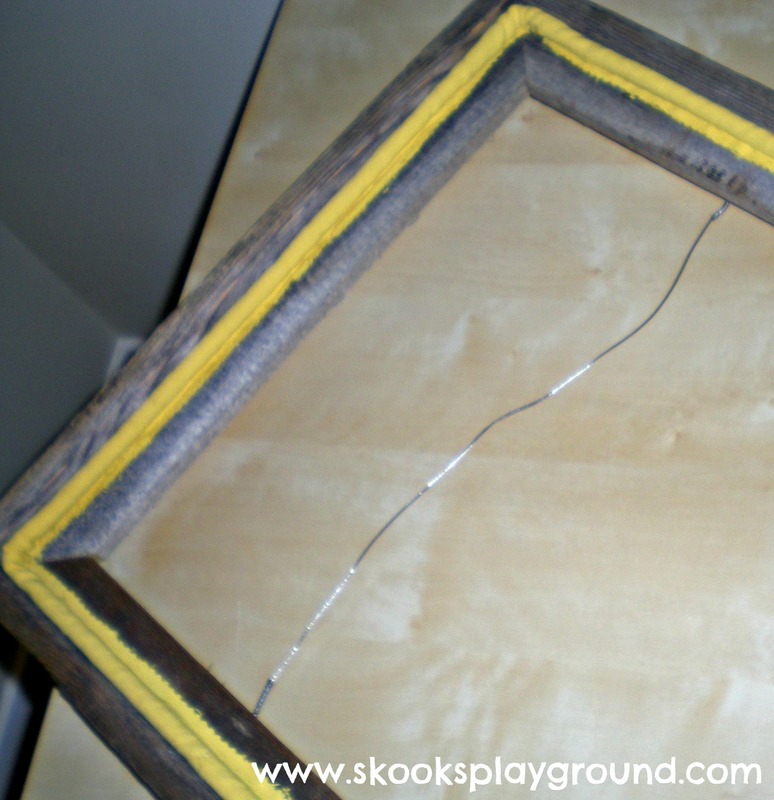 An old rustic frame that I salvaged after the glass broke. Don't ask me how it happened. 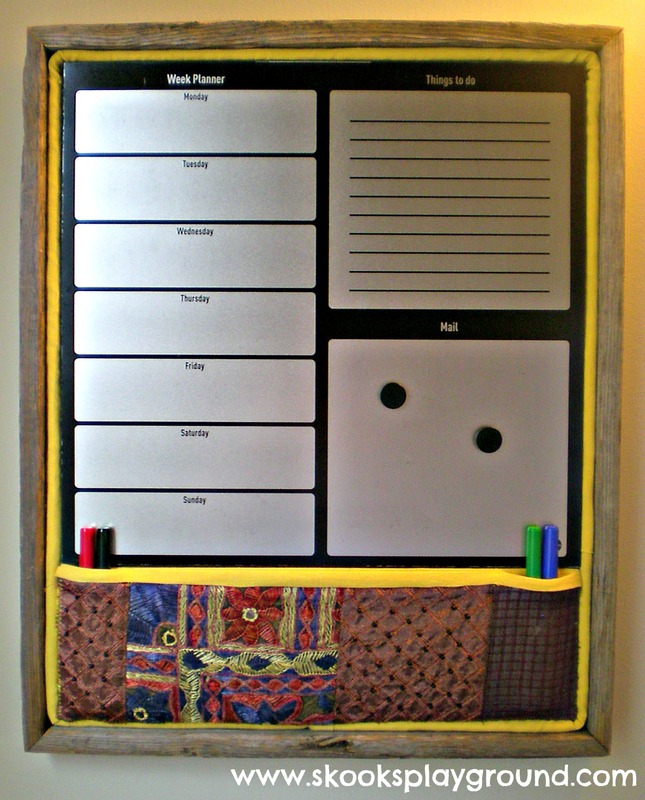 My magnetic wipe board piece I pried out of its previous frame, the pocket section I made out of some patchy fabric and foam core board, and a length of thick piping cord covered in some mustard-y fabric. 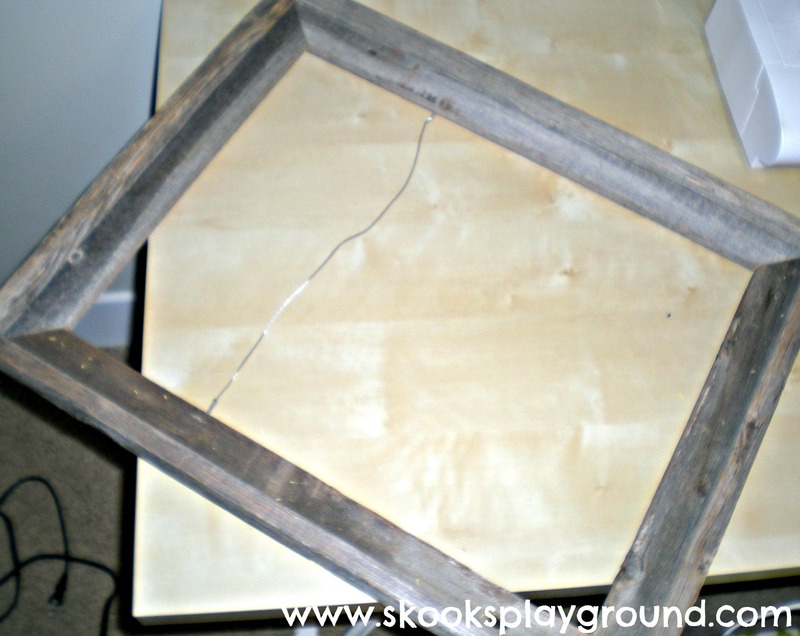 This is what it looked like after I hot glued my piping into the edges of the frame. Clear as mud? 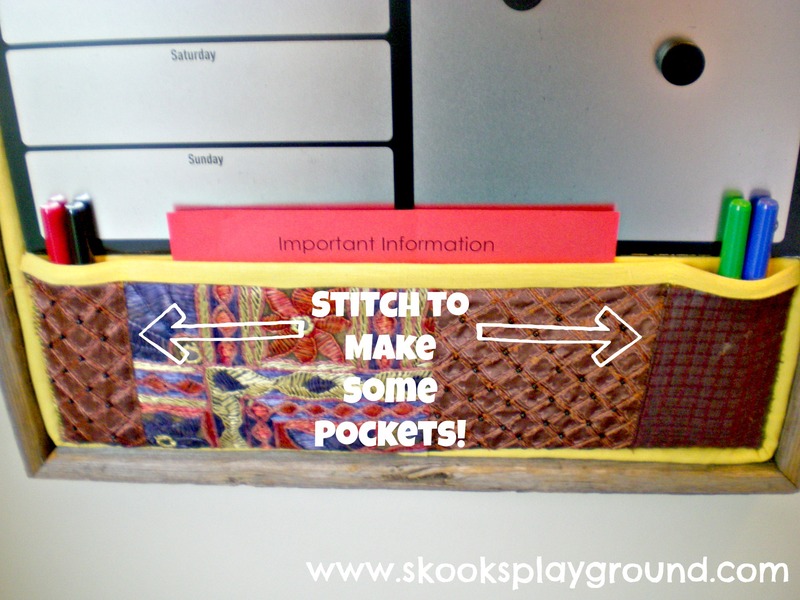 I made a pocket section out of fabric (not concerned too much with how the backing looked) . . . my fabric was patchy to start out with so perhaps it's not totally clear where I stitched it down. Poor lighting abounds in my house in the winter time. Linking up with some great parties RIGHT HERE! So, I was reminded of this little ornament e-book that I got during a BOGO sale from Erica Hite 2 Christmases ago. 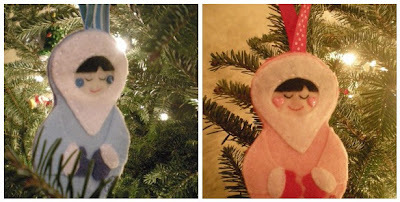 (I *think* I got it after Christmas actually, and then forgot about it for the next year and made different ornaments.) Anyway, it's not totally relevant. Point is, I forgot I had the patterns, and then I found them and that is how this story begins. 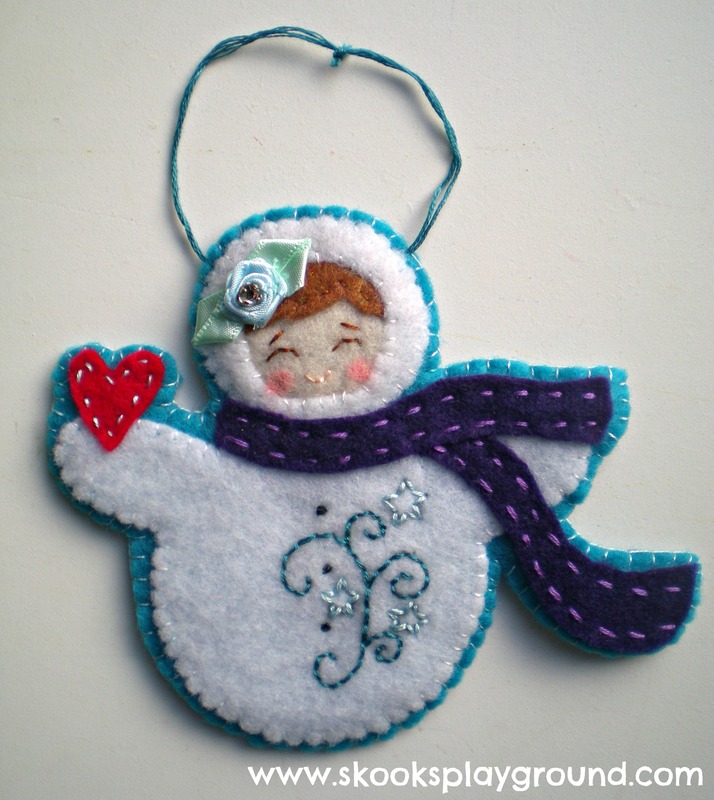 I took the Noia Land concept (and pattern piece) of putting a cute little face inside a Christmas-themed "body" and used Erica Hite's snowman pattern as the base of that. 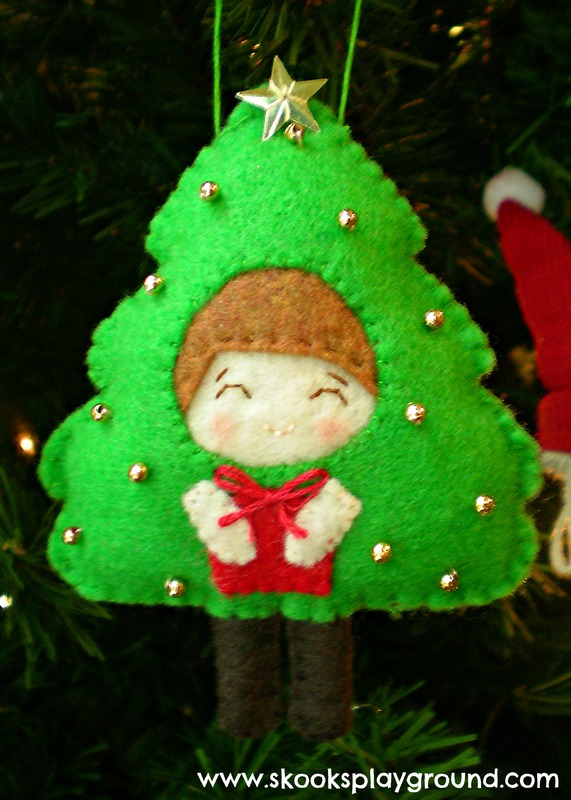 I nixed the top hat because Kiwi is my baby girl and I didn't want to make her a boy ornament. If that even makes sense. It probably does NOT. Oh well. So yes, nixed the hat . . . then I rifled through the button drawer and found the little blingy ribbon flower. That girl-ed it up a bit. Then I picked out a nice deep purple for the scarf. I opted not to stuff this one (unlike the other 2) . . . it just wasn't going to be necessary due to how it was assembled. I like that it still plays well with the others and gives the same feeling even though it's kind of doing it's own thing with the way it is embellished. I'd show it to Kiwi to see if she likes it, but she'd probably just grab it and try to eat it. How is it that she is already 7 months old?! Alright - - on to the next Christmas project. Must. keep. making. 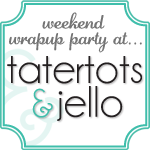 Linking up with Finish Friday and some great parties RIGHT HERE! 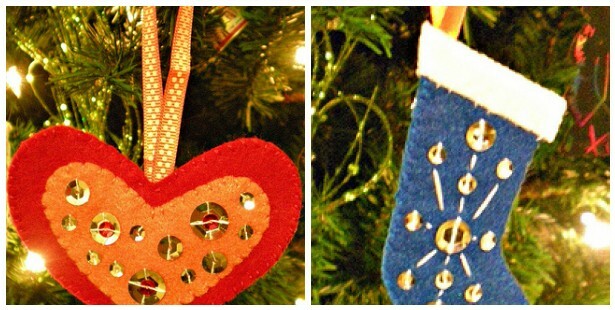 'Tis the season for ornament making. For me, anyway. 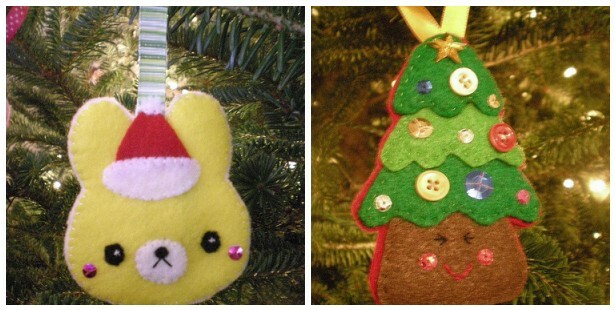 As I do every year, I am in the midst of adding a special mama-made ornament to each one of my kid's collections. I have spent all year pinning ideas for the ornaments . . . I've got quite the Pinterest board going if this is something you're interested in doing. So many great ideas floating around on this subject. 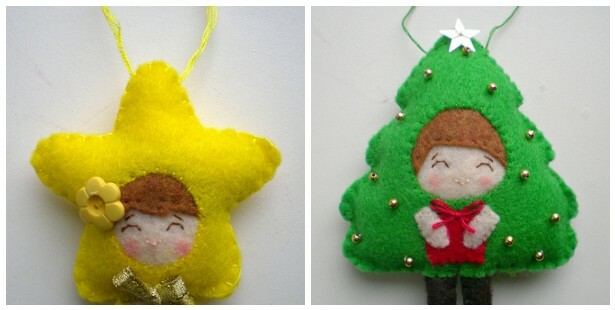 A few days ago, I finally settled on a pattern for this sweet little set of ornaments from Noia Land on Etsy. If I was super awesome, I would have used some delicious wool felt . . . but alas. I have none. And there is no room in the budget for extra material purchases when I already have gobs of felt sheets sitting at the ready in ye ole sewing room. 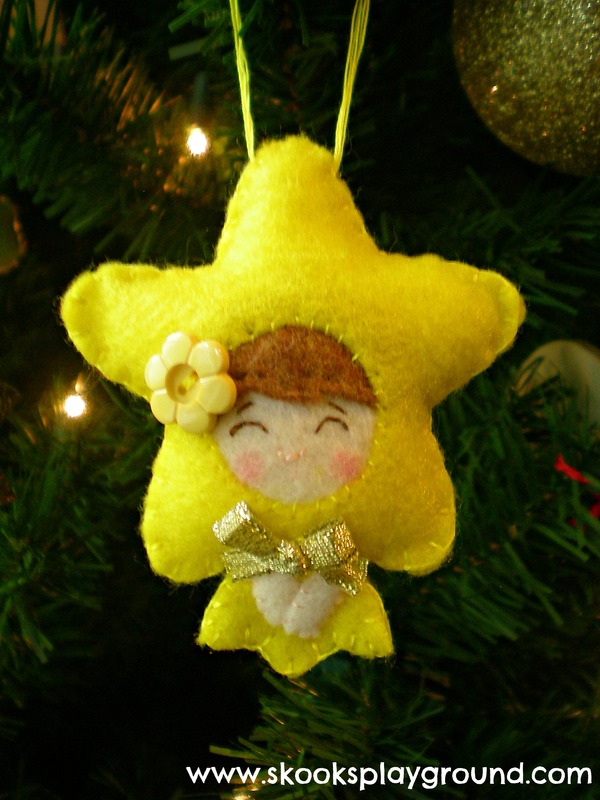 I figure that since Christmas ornaments don't get handled too much that the fact that I'm using less than amazing felt will not matter too much. None of the previous years' ornaments appear to be suffering so far. ;) The colors are more harsh than I would prefer, but I still like how they turned out. For Kee-ku, I worked up the little tree. I'm not into jewelry making as a hobby, so my stash of beads and things is severely limited. I found this teeny bag of some of these small gold beads and used them as the "ornaments" on the tree. No appropriately sized ribbon in the stash, so for the bow on top of the Christmas gift I just used some red embroidery thread. The star was a diamond in the rough . . . I found it among some other sequins I had. It was the only one in the bunch! Anyone else doing some Christmas making? I'd love to see what you've been working on!